This article is about the 1981 film. 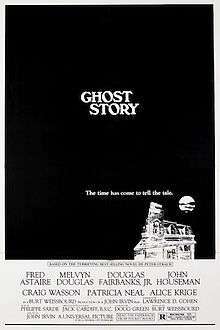 For other uses, see Ghost Story (disambiguation). Ghost Story is a 1981 American horror film directed by John Irvin and based on the 1979 book of the same name by Peter Straub. It stars Fred Astaire, Melvyn Douglas, Douglas Fairbanks, Jr., John Houseman and Craig Wasson (in a dual role). It was the last film to feature Astaire, Fairbanks, and Douglas (who died four months before the film's release), and the first film to feature Michael O'Neill. The film was shot in Woodstock, Vermont, Saratoga Springs, New York and at Stetson University in DeLand, Florida. In a small New England town during a frigid winter season, four elderly friends -- businessman Ricky Hawthorne, lawyer Sears James, Dr. John Jaffrey, and Mayor Edward Charles Wanderley -- form the Chowder Society, an informal mens club where they regale each other with scary stories. Edward's son David, living in New York City, falls from a window after seeing a girl he's sleeping with turns suddenly into a living corpse. His other son, Don, comes home at Edward's request. Edward becomes so distraught that he wanders in the snow and, seeing the same female apparition that killed David, falls to his death from the bridge. Doubting his father committed suicide, Don approaches the remaining three friends and tells them a "ghost" story to gain membership in the Chowder Society. In a flashback, Don tells the story of how he, a college professor in Florida, begins a torrid sexual affair with a mysterious secretary named Alma, costing him his reputation. Don breaks things off with Alma, he learns from David that he has met the same girl in New York and intends to marry her. Don warns his brother that she's trouble and, when he dies, suspects her of being involved in his death. The elderly friends react to Don's story. Jaffrey has a nightmare about Alma and dies of a heart attack. Sears and Ricky explain to Don that, in the 1930s, the four friends became smitten with a young flirtatious girl named Eva Galli. Edward (Don's father) who first took her to bed, but he was impotent with her. Outside her house, the other three friends serenaded Eva in hopes of catching a glimpse of her when a shirtless Edward came to the window instead, giving the impression that he did sleep with her. Edward left with his friends, and the four became very drunk, discussing Eva's prowess in the bedroom. They returned to her house, where all but Sears danced with her. When it was proposed that they leave, Sears suggestively insisted on getting his dance, to which she pointedly responded that she intended to dance with all of them. She confronted Edward about what he had told his friends, then was about to tell them the truth when Young Edward leaped to silence her, knocking her down, accidentally smashing her head into the stone fireplace. Horrified, the young men believed that the unresponsive Eva was dead. They considered calling the police, but realized it would only mean wrecking their lives. Instead, they loaded her body into her car, then pushed it into the nearby lake. As the car descends, Eva stirred inside, looking out at them from the back window, screaming and hammering at the glass as the car sank beneath the surface, taking her with it. Back in the present, Ricky and Sears admit that the death has haunted them all these years. Whereas Sears is dubious, both Ricky and Don believe that Alma and Eva are the same woman and that her ghost has returned to seek revenge. Don suggests they go to Eva's old house, now in ruins, to confront the past and her ghost once and for all. They go there, but Don falls on the rotting stairs and breaks his leg. Sears leaves in his car to seek help, leaving Don and Ricky behind. While driving through the snowstorm, Sears comes upon Eva's apparition. He slams on the brakes, and swerves to the side of the road. He survives, but is attacked and killed by Fenny Bate, one of Eva's accomplices. Ricky nearly dies at the hands of Eva's other accomplice, Gregory Bate, but Ricky stabs him and escapes to get to the authorities, telling them to pull Eva's car up from the lake to reveal her body inside. This is intercut with Don, who confronts the rotting specter of Alma/Eva. Ricky and the authorities drag out the ancient car, wrenching open the rusted, corroded door, and the undead rotting corpse of Eva lunges into view. It falls to the ground and begins to disintegrate before their eyes. Don is spared from her vengeance and the town is restored to peace. The film earned a respectable $23,371,905 at the US box office. It was the third highest grossing horror film of 1981 and the 34th highest grosser of the year. Critical reception was mixed to negative upon release. Rotten Tomatoes gave it a 35% "rotten" rating based on 17 reviews. Roger Ebert gave it a positive review, praising the performances and considering it an improvement on Straub's novel. In The New York Times, Vincent Canby had the opposite view, also praising the performances but feeling that the movie oversimplified Straub's story and themes. In 1982, the film was nominated for a Saturn Award for Best Horror Film.